Learn how to make a delicious, crowd-pleasing yuca recipe with this step-by-step guide! 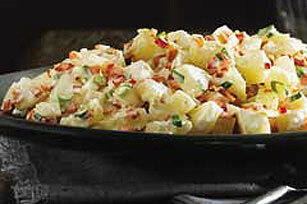 Our Yuca Salad recipe features yuca, bacon, garlic and more. Place in large saucepan; add enough water to cover yuca completely. Add vinegar and salt; stir. Bring to boil on medium-high heat. Reduce heat to medium-low; cook 25 to 30 min. or until yuca is tender. Drain. Cool completely. Mix mayo, peppers, onions, garlic and bacon in large bowl. Add yuca; mix lightly. Serve immediately or refrigerate until ready to serve. Yuca has a thick brown skin which needs to be peeled before use, revealing a crisp white flesh inside. Also, the tuber has a tough fibrous core that also needs to be removed before use. Use a sharp knife to remove both the peel and the inner core.